Should GOP Leaders Trade Renewal of the Wind Production Tax Credit for Repeal of the Crude Oil Export Ban? It is widely reported (New York Times, The Hill, Wall Street Journal) that GOP leaders in Congress are pushing to include, in must-pass tax and spending legislation, repeal of the more than 40-year-old crude oil export ban, and that Democrat leaders are demanding in return a five- or ten-year renewal of the wind production tax credit (PTC). I am a staunch advocate of abolishing the crude oil export ban and oppose all restrictions on energy exports. As Sen. Lisa Murkowski (R-Alaska) rightly points out, banning oil exports is what we do to scofflaw regimes and wartime adversaries. The United Nations banned Iranian oil exports to punish the mullahs for developing illicit nuclear weapons technology. The U.N. also embargoed Iraqi oil exports in 1990 to punish Saddam Hussein for invading Kuwait, and restricted Iraqi oil exports until May 2003 after Saddam’s removal from power. Why should we sanction ourselves? The crude export ban takes “we have met the enemy and he is us” self-flagellation to absurd extremes. Nonetheless, renewing the wind PTC carries serious risks for America’s economic and political future — risks GOP leaders may not fully appreciate. The PTC is vital to the political viability of EPA’s so-called Clean Power Plan (CPP), a centerpiece of Obama’s larger plan to “transform” America. The CPP is effectively a national renewable electricity mandate, implemented via state and regional cap-and-trade programs. The PTC, for its part, hides the full cost of wind energy from in-state ratepayers by shifting hefty chunks of the cost onto unwary federal taxpayers. Many States would likely be less “progressive” about mandating green energy quota if their ratepayers had to pay full fare. By the same token, in-state resistance to the Clean Power Plan will likely be greater if ratepayers can’t split the cost of coerced renewable energy “investments” with unwitting federal taxpayers. This matters because the CPP is a strategy for political transformation. Simply put, there’s little point in electing Red State politicians if We the People are only allowed to have Blue State policies. Implementing the CPP will Californicate and REGGIfy state electricity laws, regulations, and markets from coast to coast. The CPP will narrow both the energy policy differences between States and the energy policy choices within States, so that ultimately “we’re all Kyotoites (Al Gore Democrats) now.” In short, the CPP is designed to move America closer to a regime of one-party rule. For further discussion, see pp. 9-12 of the free-market allies’ comment letter on the proposed CPP. If the GOP gains the White House and keeps the House and Senate in the 2016 elections, they should be able to repeal the export ban. Uprooting the CPP would be a harder slog even without propping it up via hidden taxpayer subsidies. Granted, the CPP’s profound legal defects may doom it in court. But with the rise of the Roberts Doctrine that presidential legacy policies are too big to fail, it would be unwise not to have a legislative strategy for repealing the CPP. 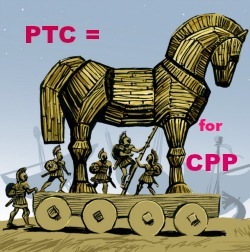 Renewing the PTC could hinder post-2016 legislative efforts to repeal the CPP. A renewed PTC would not only hide the Clean Power Plan’s full costs from ratepayers. It would also enrich and expand the coalition of “green” corporate welfare lobbyists who donate primarily to leftwing candidates.